Home » What Is Edge Support For A Mattress? When seeking out your perfect mattress, there are a lot of things to take into consideration. The material it’s made of, the support, the feel, and the value for money will likely be at the forefront of your mind. But something you may not think too much about when buying a mattress is whether or not it has edge support. And yet this simple difference can make a huge impact on your mattress, and thus your night’s sleep. Plus, there are different types of edge support to take into consideration, each with their own pros and cons. Here’s what you need to know. Edge support on a mattress can refer to the encasement around the frame of the mattress. This type of edge support is more prevalent in innerspring mattresses, to support the springs. Foam mattresses don’t actually need this type of encasement, because they already hold together on their own. However, some foam mattresses will include an artificial edge support look, because people are used to or prefer the feel and the aesthetic. There is another type of edge support, too. Some foam mattresses actually use a denser foam along the edge for increased edge support and so the mattress doesn’t compress so much when you sit on the edge. This can exist even in a mattress which doesn’t look like it has the conventional edging. 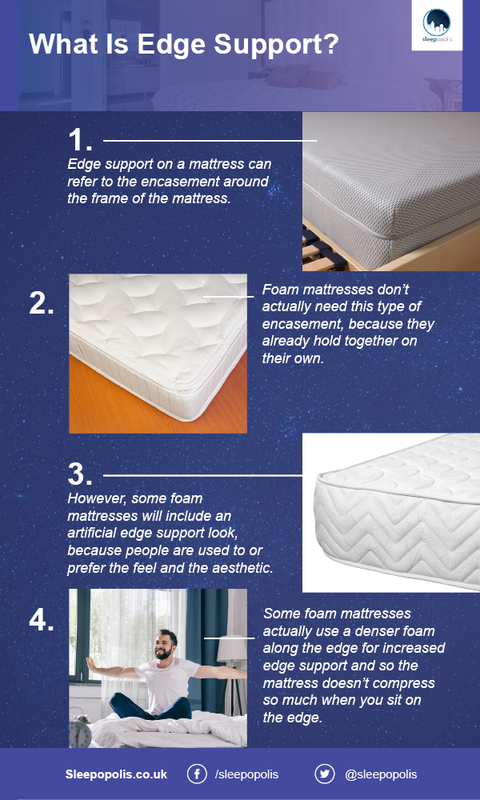 While the vast majority of foam mattresses don’t have what we would typically refer to as “edge support” (meaning a hard, rigid frame around their edges), their edges are designed to be supportive. A foam mattresses “edge support” lies in its body contouring and supportive properties. They may also include a different, firmer, and more supportive type of foam around their edges. So while there is no defined and visible edge support, you’re still likely to be able to sit on a bed’s edge, and are unlikely to fall off during the night. The most prevalent reason that people tend to favour edge support actually has nothing to do with how comfortable the bed is for sleep. 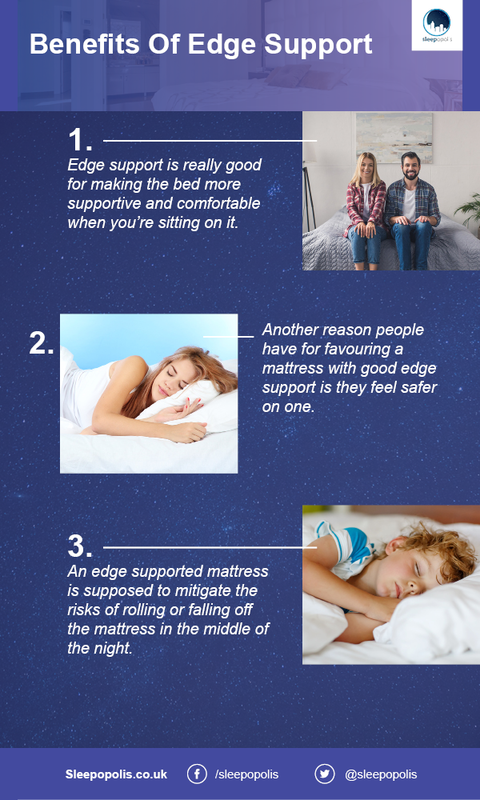 What edge support is really good for is making the bed more supportive and comfortable when you’re sitting on it – particularly if you’re sitting on (you guessed it) the edge. This makes putting on shoes, for example much easier when sat on an edge supported mattress. Mattresses with edge support are also usually easier to get in and out of, particularly for those with more limited mobility. Another reason people have for favouring a mattress with edge support is they feel safer on one. An edge supported mattress is supposed to mitigate the risks of rolling or falling off the mattress in the middle of the night. For this reason, people particularly favour them for a child’s first mattress. Whether or not an edge supported mattress is actually any safer is difficult to know, but the fact is that people tend to believe that they are. Edge supports in an innerspring mattress can be made using artificial hardening agents. This makes recycling the mattress more difficult, and can thus have a harmful impact on the environment. Edge support can also break down over time, often at a faster rate than the rest of the mattress. A worn out edge support can feel extremely uncomfortable, affecting the bed not only whilst you’re sitting on the edge, but also disrupting your night’s sleep. Even in their prime, the rigid type of edge support typically on an innerspring mattress can feel quite uncomfortably “pokey” to some. Whilst many people see edge support as a traditional aesthetic feature of a mattress, it can be argued that modern foam mattresses without visible edge support are actually more aesthetically pleasing. This is more a matter of personal preference. Who Is Edge Support Best Suited For? Many favour an edge supported mattress for children, particularly if they are transitioning from cot to bed. This is because it potentially mitigates the possibility of a child falling out of bed and possible injuring themselves. Heavier or larger people may also benefit from a mattress with edge support, simply because it means the mattress offers more support generally. This can be particularly true for heavier couples. Edge support can also be beneficial for amorous activities, which may be worth keeping in mind. Edge support is well suited for those who tend to spend a lot of time sitting on their beds. An edge supported mattress may also be necessary for those who suffer from hip or joint pain or those who physically struggle to get in and out of bed. The hybrid mattress by Hyde & Sleep has a frame of support foam around the edges. Although not a traditional edge support, it is a good option for those who want an edge supported mattress. The Simba mattress also offers a foam edge support, and is a great option for those who share a bed for this reason.